Samantha Epstein spent her summer with the dogs. Elephants too. The sophomore biology major volunteered with veterinarians for three weeks in Thailand, where she helped to care for rescued animals and learned about Thai culture. Traveling with a small team from the study abroad organization Loop Abroad, Epstein began her trip at the Animal Rescue Kingdom dog shelter in Chiang Mai, Thailand. While there, she studied under a group of veterinarians and helped provide care such as blood tests and vaccines for the rescued dogs. Epstein then spent a week at the Elephant Nature Park in northern Thailand, home to over 60 elephants rescued from trekking, logging or forced breeding programs. Epstein helped to feed, bathe and care for the elephants, as well as learn about their diagnoses alongside an elephant veterinarian. Epstein said that her biology classes at Ithaca College left her well-prepared for the trip. She was able to apply a lot of what she learned in the classroom to learning about veterinary care. 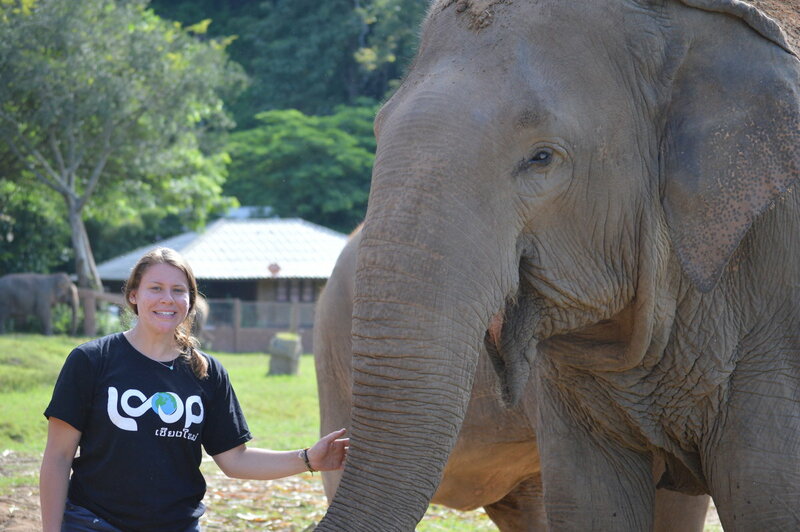 After two weeks volunteering in the veterinary care program, Epstein traveled through Thailand exploring the culture and meeting locals. She spent time meditating with a Buddhist monk, learning to cook authentic Thai food on a farm, and visiting a mountainous hill tribe village.